A Daily Diary: This is Complicated. 3:06 a.m. I went to bed at 1 p.m. yesterday, after reading a book for a long while (more below) and then finally woke up at 1 a.m. and read some more, and had a shower, and ate. Good news is, I am actually reading again...and not on the computer..which was one of my goals. 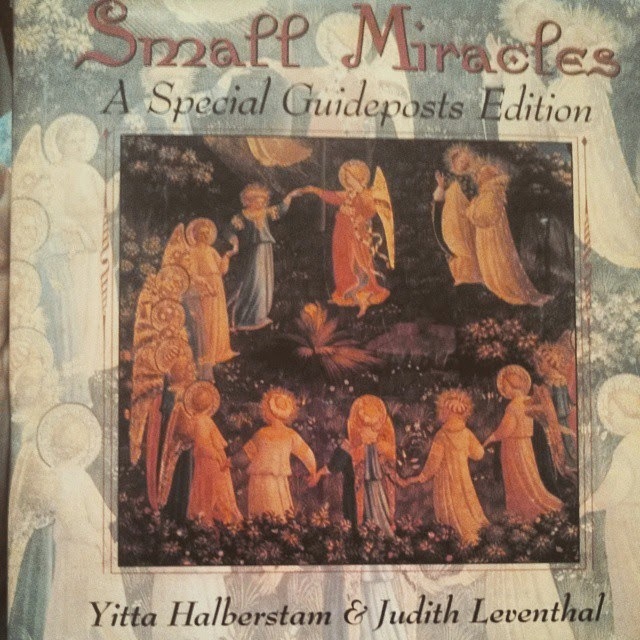 I have been reading "Special Miracles: A Special Guideposts Edition" by Yitta Halberstam & Judith Leventhal. It is what it says it is, a book full of small real-life miracle stories and a vast majority are told by Jewish people. I am a Christian, myself, but I find this book no less enjoyable. :D I'm often praying throughout it. I wish there was an image to share but there is not. This is just one book of about a half dozen I have/had in a series of stories by Guidepost of Angels, God, and Miracles. I have nothing but good things to say about them and they often remind me of the things I should be thanking and glorifying God for. True stories, real miracles. SO many many stories! I highly recommend it. 3:24 a.m. Well, I got a photo of the book, HOWEVER, I could not add it to the Amazon page for some reason, unfortunately. Oh well. April and I also had a chat about the fact...why she was bothered yesterday..because lately either I would request something like a video, or she would want to show me one, and I would end up on the phone or the laptop, not paying attention. Rob AND I both, she said. One example is this video she showed me about a rollercoaster on Minecraft, since I wondered if they had any, which features a Beetlejuice dubstep soundtrack and is kinda long...on an unrelated note I would totally love to download the song. Last night, we had to give her space. 4:24 a.m. Laptop break soon! 11:27 a.m. After a LONG time of hanging out with April, then Rob....we watched the sitcom Fresh Off The Boat, eight episodes I think, and love it. AND we talked a lot about our old school days... A LOT. Rob and I got pizza from Hungry Howies and soda while a neighbor drove us. Today, on Whisper, I got asked about the conflicts of being a Christian in relationship with a non-Christian and if I could ever do it again. Honestly no, but the discussion, which is so far inoffensive, continues. I could only share as far as a platonic relationship with one. April is going to lay down and I'm considering the same. ALSO, the pizza, LONG awaited for to buy on and it was gone quick...as well as delicious. I also got chips and candy. God bless, Jesus Died, Rose, Saved! All glory, praise, thanks and all things be to God on the highest forever and ever in Jesus Name, Amen! God is able. P.S. I can't believe the house from UP is being put up for sale. OMG! 10:39 p.m. I went to bed at 1 p.m. and woke up around 5 p.m. ish and spent some time with Rob, a very short amount of time, then slept until 7 p.m. ish before going grocery shopping with April, who was in frustrated and depressed spirits...I kept my distance most of the shopping trip. We seemed a LITTLE better after some McDonalds sweet teas and heading home. April cancelled the trip to her Mom's on account of her depression and ornery mood. I'm still keeping a little quiet distance..hoping to rejoin her when the air is more cheerful. P.S. Our snack cabinet is full. XD How odd. It's been quite a day nonetheless. Have a good weekend. P.S. My cell phone, in it's last month, has refused to update my minutes. I only have 22 left. ;/ Then nothing. Ah well...life. God Bless, Jesus Died, Rose, Saved! All Glory, Praise, Thanks, and all things be to God on the highest forever and ever in Jesus Name, Amen! God is able! 10:47 p.m. Okay, I can't just simply ignore that I had a dream earlier involving April and Coco Rocha. I don't recall what it was about..all I remember is the ending where there was this scrupulous teenage dude outside our window, smiling like he did something awful and was proud of it. He got in the house and I tried to dial 911 on a cordless landline...and also trying to lock the door in time, which was a struggle. I easily, for once, got them on the line and I cannot recall what happened afterwards. 11:08 p.m. I checked Tumblr and whatnot. I wanted to interject that lately I've been responding to my thoughts by saying, quote, "That's the way it goes." I'm loving it. -blows kiss- God bless, Jesus love homies. Peace! 11:45 p.m. I forgot to mention, unimportantly, that it is indeed Friday the 13th! Only for the next 15 minutes though. I'm almost done with the computer, lest I turn on Netflix, and April is washing dishes. We're supposed to have tacos for dinner tonight..and on a final note..I need to consider going back to reading my book. :D Reading a book seems a great deal more accomplished, somehow, than surfing the internet. Good night, God bless, Jesus love, live, save. Mwuah!